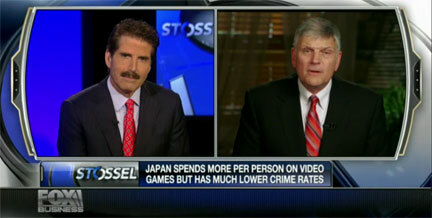 Billy Graham's son, Franklin Graham, went on tv to talk about how horrible video games are for society, and in a wonderful turn of events, Fox Business's John Stossel makes a couple amazing replies. It's not often that I agree with Mr. Stossel, but thank you sir, as this was an informed respose to Graham's ridiculous ideas. Has anyone asked Graham if he'd appreciate the Bible being taxed, because of all the violence it has caused? Not only is the Holy Writ loaded with violence, it has been the source and inspiration of violence on the largest scales possible. I absolutely love how Stossel refers to the same argument made about comics, specifically against Superman in the 1950's. Seriously, Superman- the most moral, upstanding American ideal- was cited as causing violence. Absurd.